Come to our beautiful vacation home Casa Dulce, a super cool open-air rancho located on Playa Pan Dulce (the best sand beach in the area) on the scenic Osa Peninsula of Costa Rica. Enjoy our private two-acre preserve, bring your family, friends or that special someone to slow down, take your life at a different pace, and see how much clearer everything is when you step back in to the peace, quiet and privacy of what feels like another world. Our house is a traditional "open-air" rancho design. The design is loft-style with two sleeping areas upstairs and one downstairs. The beds are all double size with mosquito net canopies over each. Each bed has its own reading light and fan. There is a full kitchen complete with stove, refrigerator/freezer, hot water and all cooking utensils. There is a walk in (solid concrete) lock-up for valuables such as cameras and wallets, etc. The living room adjoins the kitchen area with a couch and chair. The kitchen has a nice family table (seating for five, a tight six)...all with a beautiful view of the ocean. The front porch is the highlight of the house with its beautiful Cristobel bar and bar stools overlooking the pool and kitchen area. Imagine sitting by the pool, watching the breakers roll in while catching a glimpse of the scarlet macaws flying overhead and the monkeys scampering by to get coconuts from the trees in the yard. It's paradise found. Come to relax and enjoy the solitude of the private two-acre preserve, and if you need to stay connected, we do have Wi-Fi! 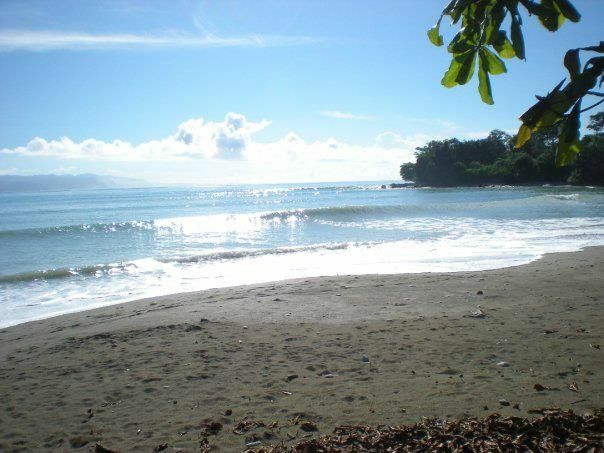 Keywords: House, beach front, bungalo, beach house, jungle, osa peninsula, surf, costa rica, matapalo, pan dulce. Owner Rick Hardy has frequented countless beaches and surf spots in the past 40 years - landing on the Osa as his second home. The beaches are beautiful and still relatively uncrowded (compared to more touristy spots like Guanecaste or Tamarindo). If you are looking to slow down, enjoy everything the jungle and beach have to offer - you've come to the right place. If you're looking for bars, crowds, and connectivity back to the real world, you may want to keep looking, but if you're wanting to unplug, unwind and totally let your hair down, then you've found the right place. Located on one of the best sand beaches in the area (family friendly), Casa Dulce offers the comfort and ease of beachfront living. You literally have a view of Punta Pan Dulce (one of three of the major surf breaks) as the waves come wrapping around the point. If you're a surfer, this is invaluable because you can simply take a look out at the break to check conditions and tidal movement. Playa Pan Dulce is the safest beach in the area for small children and beginning surfers. The vast sand beach runs north (toward town), ending at a large rock outcropping. Fishing from the beach offers great action, where anglers can catch anything from a Red Snapper to a Snook, while more often hooking into the local "Jack" fish. Strong and fun to catch, the jacks will keep you hopping and if YOU don't want to eat them, you can typically find a tico fisherman who is more than happy to take your jacks off your hand, sometimes even taking them off your lure. The beach is right in your front yard, and the actual front yard is beautifully manicured with all types of different flowers and plants as well as many different birds and animals. Our LOCATION is probably one of the most obvious benefits of staying at Casa Dulce. Located on the first driveway on the left after entering Matapalo, Casa Dulce removes all the hassles associated with the Matapalo Beach Road. Once you walk down the road, you will know! Bed linens and pillows provided. Internet is available, but cannot be counted on at all hours of the day. Bandwidth is limited and utilizing early morning hours or late evening hours will maximize connectivity. Full view of Playa Pan Dulce from the living room which has a couch and chair, adjoining the kitchen. Four top burner stove top with an oven. Full set of dishes, bowls, cups, and glasses, and full set of utensils. All kinds of books. Please feel free to read any of our books and even swap one out when you leave one of your favorites. All sorts of board games, including some outdoor games (ping-pong and horse shoes). Please bring your own favorite game(s) and consider donating to Casa Dulce...bring 'em, play 'em and leave 'em. Our property (specifically the front yard) is beautifully manicured with numerous flowering and ornamental plants. The yard opens up with a direct view of Punta Pan Dulce. We have two kayaks onsite that guests are welcome to use. Just let us know and our caretaker will get them ready for you. The patio and deck both face Playa Pan Dulce with beautiful views of the waves as they come crashing toward the shoreline. If you're a surfer, you can chcek the surf from the front porch or deck. We have four SURFboards onsite that guests are welcome to use. Just let us know and our caretaker will get them ready for you. Wonderful waterfall fed (solar powered) plunge pool with connecting sunning deck, perfect for sun bathing, and early morning and late afternoon Yoga sessions. Casa Dulce is everything it should be. Nestled in the jungles of the Peninsula de Osa, Casa Dulce offers the most outrageous wildlife with four different types of Monkeys, Scarlet Macaws, Toucans and more all around the property. My family loves to come to Matapalo and Casa Dulce is the best! I know the pics don't do it justice, but this place is amazing for people/families that really like the true Costa Rica. The amenities are off the grid but don't be fooled. It has every amenity a normal home has except for a television. We saw so much wildlife in the yard, and the ocean was spectacular in the front yard!. We brought a 16yr old friend of my son's and he was in awe. The Monkeys were amazing and so was the fishing. We have been coming to Costa Rica for the last 20yrs, and even owned our own home here for three of them. We will not hesitate the rent this home again (if it is available). It is one of a few homes in the area with its own small swimming pool. It is an awesome amenity to get cooled off. This place is for nature and ocean lovers that want to see what Costa Rica has to offer in the wilderness. It is not for the "resort minded" traveler. The stores in Puerto Jimenez have every amenity anyone would need with many "local style" restaurants to choose from. Or go to the local supermarket and get anything you will need for an awesome vacation. I cant stress how awesome this vacation was for us with this type of amenities. We brought our niece with us who is 10yrs old and she didn't want to leave. We will rent this home again as long as it is available, in a heartbeat! If you are a "resort minded" traveler, give this place a try, I almost guarantee you will not go back to the "resort life" . Also, don't let the "open design" scare you. We had no issues with bugs or even mosquitos at any time of our stay. Naturally, we saw some quite interesting insects (outside), but our 10 and 16 year olds loved it. Yes it is warm, but with the pool and ocean footsteps away, cooling off is easy. We were used to the heat in one day and didn't want to go back to Michigan! (snow). Honestly, give this place a try. We think you will love it!!!! Y’all are an awesome family. It was really fun getting know y’all, especially playing games! Please come back next year! Y’all should just become regulars. Sloth in the tree above the pool, spider monkeys and makaws everyday! Caught a yellow snapper right in front, off the beach. Clean house with all the necessities. Great pool to cool off. Beautiful landscaping. Will be going back every year I can. Glad y’all had a good trip! Would love reviews from the kid’s perspective and it would be great to hear from all of the adults! My adult kids and I had a wonderful time staying here for almost two weeks. The beach is so quiet, water warm and calm; saw all four types of monkeys and lots of other wildlife. Pool was perfect for cooling off. Enjoyed eating at Martina’s, surf lesson, paddle boarding, and chilling in the hammocks. Recommend highly for the true nature lover! Great place to relax and commune with nature. Quaint, comfortable home in paradise. Perfect for a family, several individuals, two couples or a romantic getaway. Loved the fact that we could coexist with the wildlife. Three different types of monkeys visited our front yard trees. Scarlet Macaws flew across the yard several times a day and basilisk lizards frolicked beside the wading pool. The beach abutted the front yard. No need for beach umbrellas as beautiful trees provided a natural canopy. We enjoyed swimming in the ocean and kayaking. One morning a couple of dolphins played about 200 feet from my kayak. We also enjoyed watching the surfers. The caretaker of the home took us on a great hike. He was knowledgeable about the plants and wildlife. There is a restaurant/bar within walking distance that served excellent food. The owner of the home, Rick, was very pleasant and accommodating. He provided lots of useful advice before our trip and was very responsive during the trip with any questions that came up. It was wonderful to have wifi access in the home. It made it easy to stay in contact with family when necessary. Hey Patricia, so happy that your stay at Casa Dulce was so wonderful! I knew you'd love everything about our little slice of paradise! Can't wait for your next trip...tell all your friends! My wife and I went down to Costa at Matapalo to celebrate our 39th anniversary, relax and plan for our big 40. We were so WOW-ed by this place, we want to spend our 40th here. It is a perfect beach bungalow, perfect for a surfer, artist or naturalist who wants to relax. Our first time staying there, but going back again next month and next year. We hope to be regulars and be able to give excellent reviews ten years from now. We have contact info for various attractions: eco tours, waterfall repelling, bungee jumping from Matapalo trees, surf lessons and select restaurants. Please let us know if you'd like more info or to be connected!